Events can now be Time based in addition to just Turn based. 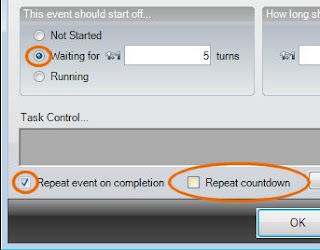 This means that instead of the event start, length and sub-events all being defined in terms of turns, they can be defined in seconds instead. This allows you to create events that trigger completely independently of user input. Rather than having to independently setting the length of the event in addition to any sub-events, the length will automatically be calculated based upon the sub-events you add, making it quicker to create the event. When sub-events are moved up or down, they stay selected, making it easier to move them further up or down the list. It is now possible to dynamically change the article, prefix and name of an object, by setting the relevant property of the object in a task action. 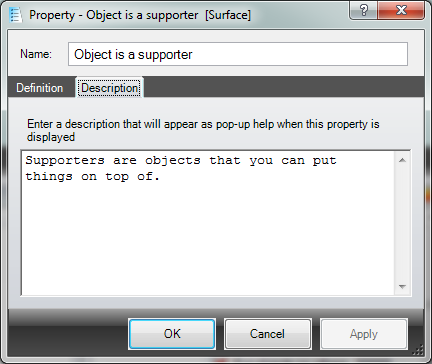 This can allow you to change how an object is referred to in the game, and removes the need to swap out objects with other objects if their description changes. 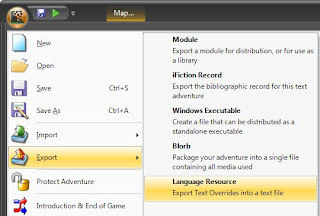 Or if you select Export Module from the main menu and if you have items selected, you will be prompted whether you wish to export just the selected items. Last Window Size and position are now stored within a Blorb/EXE, so you can distribute your game with your preferred layout. The default for ADRIFT, is to aggregate the output of tasks. So for example, if you type "get all" and there are two objects in the room, it will state "You pick up the red ball and the green ball" instead of "You pick up the red ball. You pick up the green ball." You can now change this behaviour on a task by task basis by deselecting the Aggregate output, where possible checkbox on the Advanced tab of tasks. Loops can now be created around task calls, allowing for much greater flexibility. I have added a new URand (Unique Random) function, which takes the same parameters as the Rand function (i.e. a single value, or a Min and Max values), but which will return Unique values within the range until all values are exhausted. e.g. URand(1, 5) might return 3 the first time you call it, then 2 the next time, then 5, then 1 then 4. On the next call it will return any random number from the range and uniquely work through them again. Again, it has taken me quite a while to get this release out, having squeezed in development as and when I can, but hopefully it will be worth the wait. There are some exciting enhancements, amongst which is the ability to make debugging your games easier and more enjoyable. 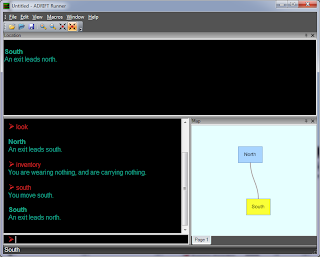 ADRIFT 4.0 supported the ability for the game designer to change the background colour. This functionality is now available in ADRIFT 5.0, allowing background colours to be changed at any point within the game. The background will remain this colour until changed again, or set back to the default. Where colour is a named colour (e.g. red, green, blue etc), a hexadecimal colour code (e.g. #FF8800, #123456) or simply "default" to set back to the default colour. Default colours for the game can now be set in Developer. 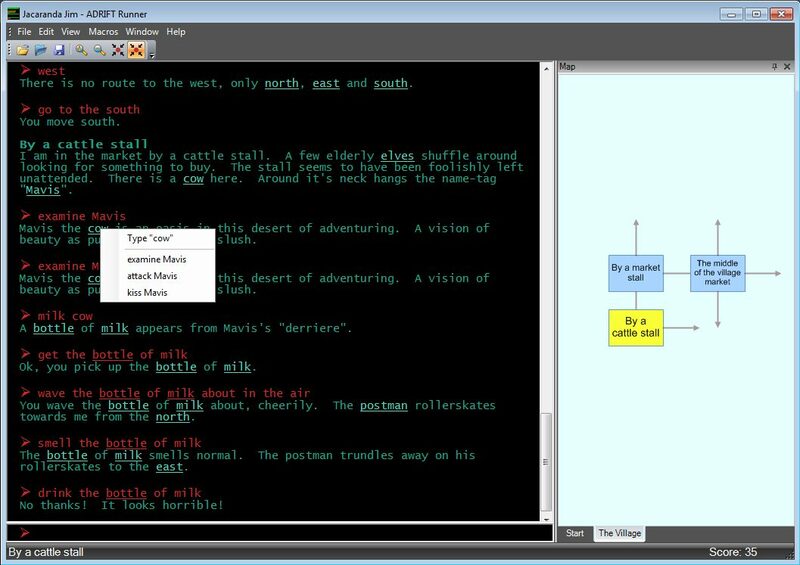 This allows the author to set the game colours appropriately for the atmosphere of the game. It also allows them to set a suitable background colour for any font colour changes within the game. The person playing the game can choose whether to allow these colours, or to use their own preferred colours. All reference types now support multiple references per task command. This means you can have %location1% and %location2% in the same command. Same goes for Number, Text, Direction and Item (previously only Object and Character supported multiple references). The property values can be changed by either selecting a new value from the dropdown, or by over-keying the value currently there. Changes will be reflected immediate within the game currently being played in Runner. 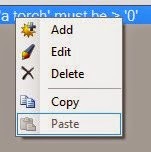 A new task action has been added, allowing a particular task to cause a certain amount of time to pass. If you change an object from Static to Dynamic (or vice-versa), the location of the object is no longer reset to hidden. So a static object in a single location will default to a dynamic object within that same location, and similarly objects that are parts of characters default to being held by that character. This makes it easier to make changes to object types in the game, and is especially useful if you use the Add Object to Location menu item. When you select a folder from the tree view, that folder will automatically scroll into view if it happens to be off screen. This is useful if you have lots of folders open, and lose track of where each one is. There is now a new menu item in the Add Specific Task menu when right-clicking on a Location to run a task whenever the player enters that location. This shortcut will create a System task with that trigger pre-set. Allow Specific Tasks to be hidden. The Prevent this task from being inherited checkbox is now available on Specific Tasks (as opposed to just General Tasks) when that Specific Task does not "use up" all its references from its parent task. This allows you to prevent the Specific Task appearing in the dropdown menu when creating other Specific Tasks, thus reducing unnecessary clutter. 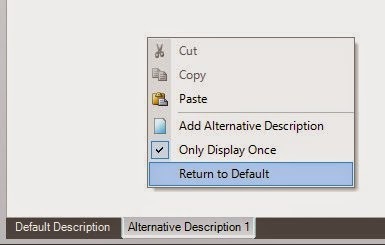 If you have a description that only displays once, you now have a new option that will "reset" the message back to the default description. This effectively allows you to cycle through the descriptions infinitely. When loading and saving games, the filename is now displayed. This is useful when the command "save" is used, so you are reminded which filename is in use, and also when looking back over transcripts. A new restriction to check whether a character is visible to another character has been added. This takes closed objects into account. 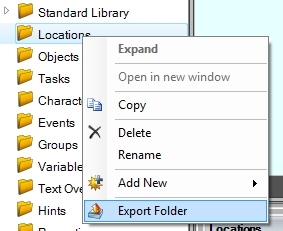 Items can now be dragged from a folder onto another folder in the tree view, making organisation even easier. Multiple restrictions and actions can now be selected in the task windows, allowing them all to be moved or deleted in bulk. It has been a little while since the previous release, somewhat hampered by work, computer crashes and relocating the website, but the new release is finally available. This brings some exciting new enhancements, plus a few critical bug fixes. 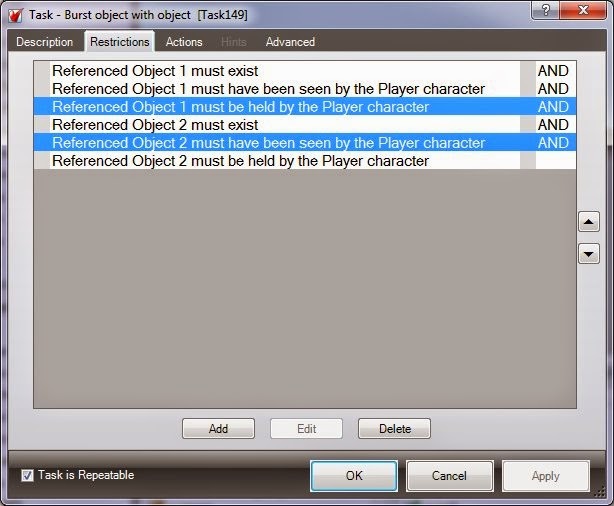 Item functions have, since 5.0.26, been able to restrict a list (of characters, objects etc) to those having a particular property. This has been taken one step further by allowing to restrict by properties with a particular value. Each game you play will now store it's window layout separately. This is handy because you may resize the map in one game to be a particular size based on that game layout, but have a completely different layout for a different game. It is also very useful for the Multiple frames enhancement below. For example, you could create an "examine %item%" task, that would match on "examine bird", "examine Hamish" or "examine bedroom". In conjunction with the new Referenced Items, properties can now be assigned to items generally. This can allow more efficient tasks to be written for properties that any item could have, such as odour, colour, sound etc. Synonyms have been supported in ADRIFT 5 for some time now. However, there was no way to edit them in Developer. This has now been added. For further info, see http://help.adrift.co/Synonyms.html. User Defined Functions allow you to create your own custom functions, with parameters if necessary, that you can use within any text section or expression. For further info, see http://help.adrift.co/UserDefinedFunctions.html. Properties for Objects, Locations, Characters and Groups can now be made "Private". This means that the new property will only be listed in the particular item that it has been made private to, thus not cluttering up all the other items with irrelevant properties. Properties can now be given descriptions. These appear as tool-tips when viewing the properties in items, to give additional information to the game author. A default for whether to make task messages appear before before or after actions can now be set in Settings. This can be overridden in each task on the Advanced tab. to get a list of all the items in that particular group. The property editor has had a makeover, so options that are not required for the current property are hidden away. This makes it less cluttered, and hopefully a little easier to use. In Settings, you can now specify that key names should be generated based off their item names. So for example, if you create a character called "Bob", instead of his key being Character1, it will now be Bob. This makes any item functions more intuitive, e.g. you can type Bob.Held.Count instead of Character1.Held.Count to get the number of items he is carrying. Yes, ADRIFT finally has built in help. To access help, simply click on the question mark icon in the top-right of Developer, or click on the question mark on any screen to go straight to help for that section. The help file has detailed help for each section, plus lots of tutorials. It is also still being added to. An online version can be found at http://help.adrift.co. The menu when you right-click on an object or character has been enhanced to show more relevant tasks. This makes it easier to find the specific task you want, rather than a long list of tasks you would never use. ADRIFT 5 release 29 is now available for download from the ADRIFT website. Rather than simply list the changes, I thought I might try and give some explanation of the enhancements this time. If you type the name of an event key in any text box followed by the dot character, it will now bring up a menu where you can select either Length or Position. These two new functions will return an Integer value of the length of the event (in turns), or the current position of the event from the start. These can be useful, as you can create restrictions that an event must be before or after a certain position. I have added a new checkbox on Events, so that if you have a delay at the start of the event (i.e. the event should start off waiting for X turns) and also you have the event set to repeat on completion, you can now select this new checkbox to wait again before the event starts, effectively allowing you to insert a pause between each run of the event. The top card is the Queen of <# OneOf("club", "spade", "diamond", "heart") #>s. Several users have had problems with the DirectX sound interface. As a result, I have added a new interface, using WinMM. 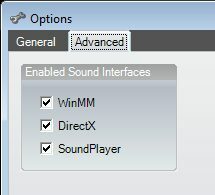 This is now the default interface for sound, as it doesn't require additional DLLs (so Runner no longer requires the Microsoft.DirectX files). 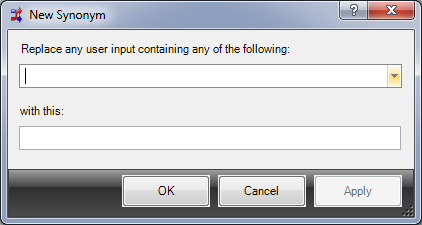 You can enable or disable individual interfaces in Runner Options > Advanced in case any particular interface causes a problem on your machine. In addition to this, the debugger will now specify which interface is being used when a sound file is being played. Replace("one two three", "two", "TWO") would return "one TWO three". Ctrl+M now closes the map in Developer, as well as opening it. This will create an *.alr file, in the same format as that used in version 4. ADRIFT 5 release 28 is now available for download from the ADRIFT website. This is somewhat earlier than expected, but I felt it necessary in order to fix some irritating bugs for new users playing packaged games. 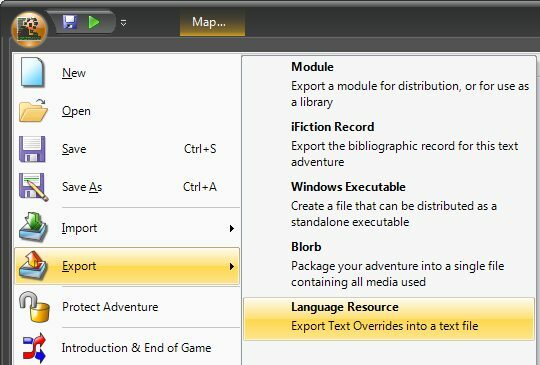 There are two enhancements in this release; being able to import v4 style ALR files, and the ability to print out the map. ADRIFT 5 release 27 is now available for download from the ADRIFT website. 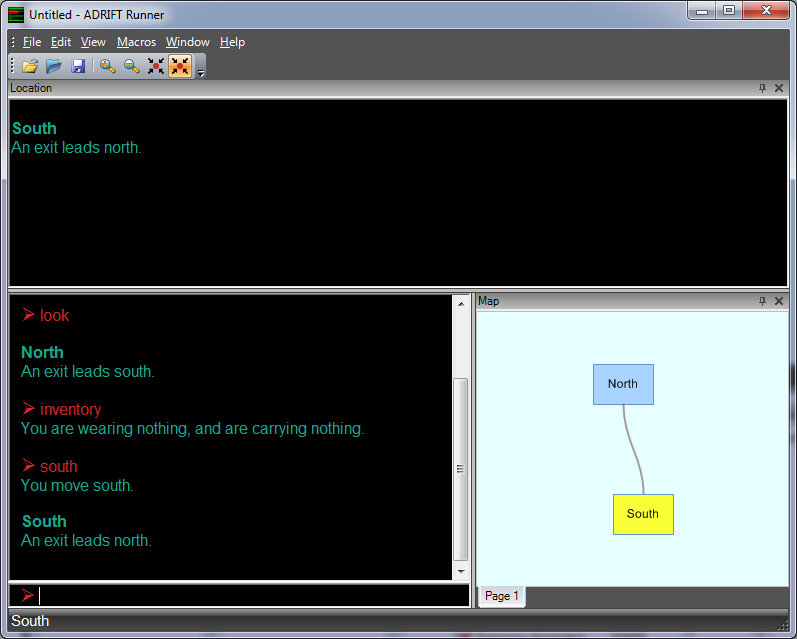 The main highlights in this release are a redesigned Objects form, highlighted links, and improvements to the parser. Version 5.0.27 will introduce optional links to show which keywords are clickable. Runner already brings up a menu when certain words are clicked upon, but this will make it more obvious. This makes it easier to play games using only the mouse, should you wish to do so.